PDF, the popular Portable Document Format, is a widely used file format for email archiving. If you need to convert msg into pdf, you need a software package that renders the .msg messages accurately, converts or embeds email file attachments, and gracefully handle remotely hosted elements. It’s frustrating to embark on an converting thousands of msg files to pdf, only to find out at the end that the results are inconsistent or problematic. 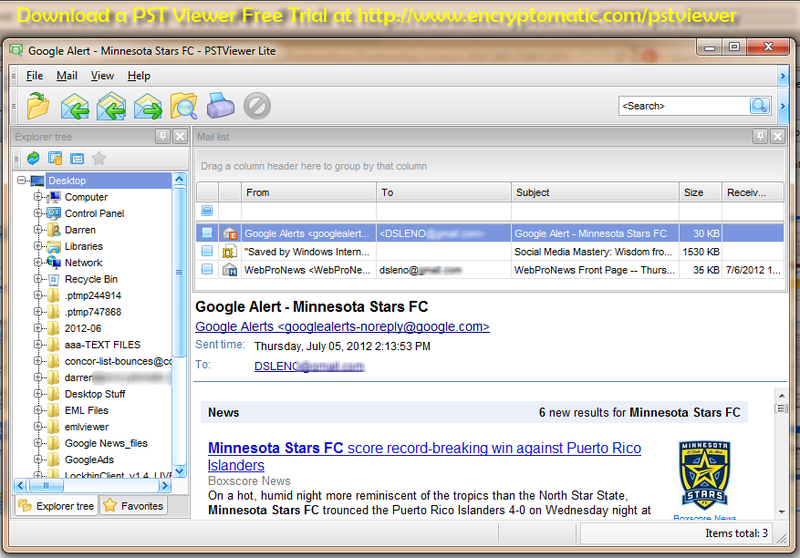 PstViewer Pro software is much more than just a Outlook pst file viewer. It can also let you convert Outlook msg files. In fact, PstViewer Pro is six viewers conveniently rolled in one. In addition to PST files, it can view, search and convert MHT, MSG, EML, OST, and Winmail.dat files. PstViewer Pro will open and convert individual .msg files, and can be set as the default Windows software to manage msg files. This allows you to just click on and open the file. It will also read and list a directory containing many thousands of Outlook msg files, and then let you convert those MSG files to PDF or other formats. To convert email to PDF with Pst Viewer Pro, download a free trial of Pst Viewer Pro. In trial mode, Pst Viewer Pro allows the full conversion of up to 50 .msg emails at a time. This 50 file limit is removed after purchasing the software. When Pst Viewer starts, select the folder containing your Outlook msg files. 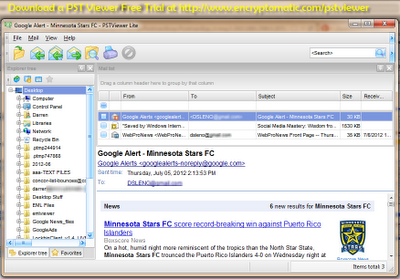 Pst Viewer Pro will quickly read in the email header information and display it in the email list. 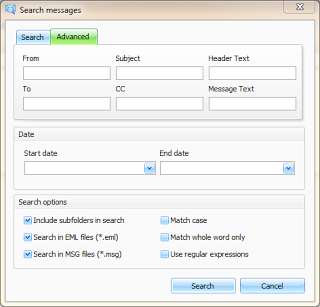 You can perform search operations on your MSG files prior to exporting. To do this, click the “Search” icon, and enter in the criteria. You can search msg files by date, subject, sender, a date range, etc. If you simply want to export all of the msg emails in your list, type CTRL-A to select all emails. Next, click the Export button from the software toolbar. This will bring up the Export Manager. Choose the profile of conversion that you need. PDF – attachments embedded. This will leave the MSG file attachments in their original state, embedding them inside the PDF document as separate files. This is a nice way to do it, because the file can later be extracted from the PDF and edited or otherwise manipulated. PDF – attachments converted/included. This profile will convert MSG file attachments into the PDF image. PDF – attachments saved to disk. Selecting this profile will convert the email to PDF, but any file attachments will be removed from the MSG file and saved to a location you specify. PstViewer Pro also supports the conversion of multiple .msg emails into a single PDF file since version 4.7. Below is a screen shot of an MSG to PDF file conversion using Pst Viewer Pro. Any embedded or OLE objects are included in the conversion. Hyperlinks are active. Remotely hosted graphics or other elements are downloaded and embedded. Although this article has focused on using Pst Viewer Pro’s user interface to convert .msg to .pdf, you can also use it from the command line in a batch file, passing a file name or directory parameter to Pst Viewer Pro. I’ll just mention it here; the full details are included in Pst Viewer Pro’s accompanying manual and help file. 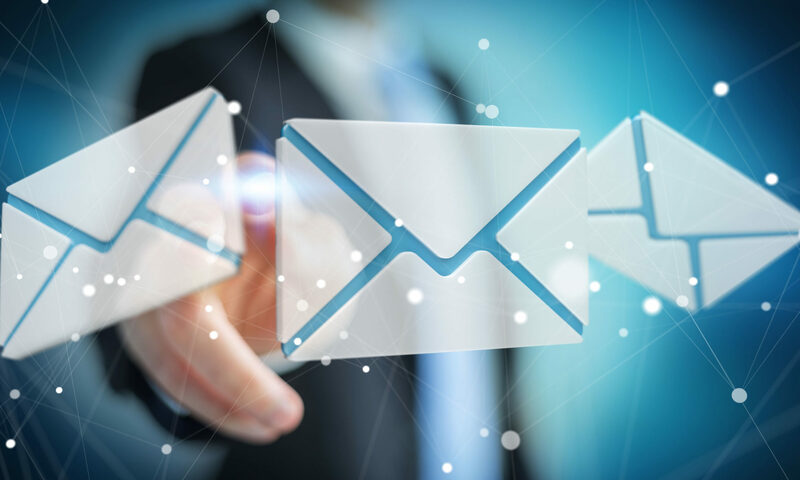 Click here to read an article that describes the email command line conversion process for Pst Viewer Pro. Although the article focuses on Pst files, just substitute msg files and you’re on your way. There are few if any Msg to PST conversion utilities that can match the quality and consistency of Pst Viewer Pro. Twelve years of user vetting and exposure to complex MSG file situations have allowed Encryptomatic LLC to produce the premier tool for converting MSG files to PDF. Download a free trial, and we’re sure you’ll agree that Pst Viewer Pro is the right choice for your project.